« June Is Audiobook Month (#JIAM 2012)- What Are You Listening To? Nora Ephron wrote some of my favorite movies. The Deli scene in, “When Harry Met Sally. “I’ll have what she’s having.” Genius!! She was the voice of women in a male dominated world of writer/directors and producers. Nora Ephron’s writing in Julie and Julia made me fall love with Julia Childs. Of course it had two of my favorite actors, Meryl Streep and Stanley Tucci. I remember seeing one of my best friends in a play on Broadway that was written by Nora Ephron, Imaginary Friends. I thought she was quite clever. I have yet to read her book: I Feel Bad About My Neck: And Thoughts About Being A Woman. I can only imagine the book is as clever as her other body of work. Oh it breaks my heart that another incredible talent has transitioned from this physical plane. There must be some amazing stage on the other side. 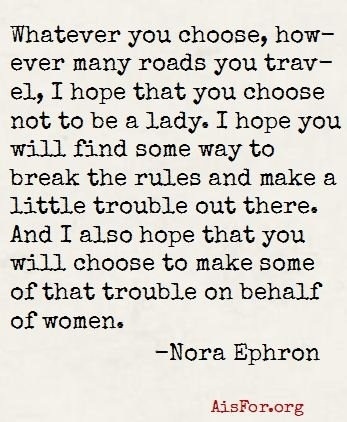 Thank you Nora for speaking from a woman’s perspective. Your creativity will be sorely missed. This entry was posted on June 26, 2012 at 10:44 pm and is filed under death, life, people, the biz. You can follow any responses to this entry through the RSS 2.0 feed. You can leave a response, or trackback from your own site.